Exfoliating, rich and stimulating, this Cranberry & Mint Soap is truly decadent. Enriched with skin-loving oils, butters and coconut milk, this bar is formulated to soothe, refresh and hydrate while it cleanses from head to toe. 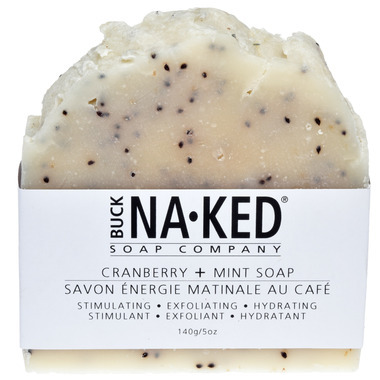 Try the Buck Naked Soap Dish! 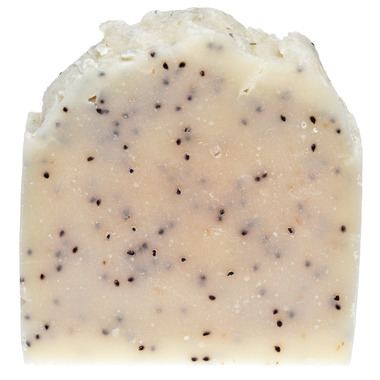 Beautifully handcrafted, its large size perfectly fits your Buck Naked Soap Bar. Its also made out of raw pine, which helps your soap dry before its next use, allowing it to last longer. Directions: Massage wet bar onto skin and rinse. When cleansing delicate facial skin, follow with your regular toning and moisturizing routine. Discontinue use if irritation occurs. I love the scent and love this brand but this soap was too harsh on the skin in terms of exfoliating and actually scratched me. Iâ€™ll stick to the smoother ones but that was my only issue with this bar! This soap is my absolute favorite. It exfoliates without being rough on the skin....the smell is fantastic and not too strong, and it leaves my skin refreshed, soft and clean. Love Buck Naked soaps and this one smells good. Bought this natural soap recently and loved it. I have very sensitive skin, this cleans, exfoliates, and leaves no soapy film. I will definitely buy it again. Love their soap! The cranberry mint one is such a nice exfoliant and is amazing for sensitive skin! We LOVE Buck naked soaps. As someone with a lot of skin allergies/sensitivities, I have zero problems with this soap. Smells amazing!! Love everything about it. Love this soap! It smells nice, gently exfoliates, and contains no palm oil. Even my boyfriend has been using it and he hasn't used soap in ages. Great soap, awesome smell. Will purchase for Christmas gifts. A nice treat for a little indulgence. This soap is fantastic! Smells heavenly and leaves skin feeling super soft! Love, love, LOVE!